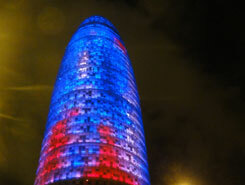 The big red and blue illuminated tower in Barcelona is called “Torre Agbar" and is located in Plaza de las Glorias. Its name comes from Castilian Aguas de Barcelona, which is the municipal water company and a member of Grupo Agbar today. 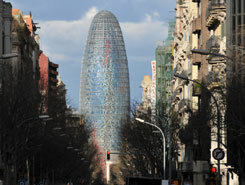 Grupo Agbar is a holding with 220 companies which are in charge of several sectors of the infrastructure of the city. 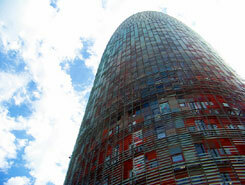 The headquarter of Grupo Agbar is located in this tower, which was designed by a French architect, together with b720 Arquitectos from Barcelona. The french architect Nouvel was inspired by the natural and organic forms of Gaudis workpieces and as well of the mountains of Montserrat. It represents a water fountain that constantly changes its colours. The coloured aluminium sheeting reflects the lights which consist of 40 different colours. The building looks like a geyser reaching the sky above Barcelona and at the moment it is the highest building in Barcelona – until Sagrada Familia is finished. The Torre Agbar is most impressive at night, when it is illuminated – 4.500 glass panels are changing their color permanently – a great spectacle. For some special events, there are special illuminations displayed on the tower, for example for New Years Eve or the International Day of Water (check dates on the website). Unfortunately it is not possible visit Torre Agbar, just the lobby of the building, where an exhibition about the history of water treatment in Barcelona takes place. The tower is illuminated in winter every day from 19:00 to 23:00 and in summer (28/3 – 31/10) from 21:00 to 24:00.